Advancing Time: An Example Of Local Government Run Amuck! An Example Of Local Government Run Amuck! Public Was Sold Bogus "Artist's Renderation"
One of the several projects proposed in the city where I live reflects what is happening across much of America. We should all be concerned at how financial restraint is being cast aside to create cookie-cutter cities and an illusion of growth. Four projects have been proposed or are about to begin. One has to do with a massive investment along the rivers that run through downtown, it includes walks and shops. The second a 20 million dollar revitalization of a one block historic area into a multipurpose area containing apartments, shops, retail space, and entertainment. Next, comes a new downtown arena that would compete with our recently expanded coliseum just three miles from the city center. Last but not least a new apartment tower downtown, it is this project that I want to write about today and the incestuous financing that should send fear into the hearts of all American taxpayers. Proposed Riverfront Development More "Costly Fluff"
Fort Wayne is a city of over 250,000 people, a nice size in that it is large enough to offer the amenities of a large city without the hassle and overpowering difficult problems that often result from living in a concrete jungle. The city located in an area that thrived during America's industrial revolution boasted of major employers like International Harvester, Dana, and GE in the days when manufacturing was king. Like many cities in America, the downtown area struggled as businesses relocated from the city center as the national trend of developing suburbia unfolded. After World War II when the nation started planning the interstate highway system the city voted "no" on the idea of running an interstate through the downtown and in the decades following many decisions to locate major projects on the outskirts or suburbs added to the downtown's decline. Current government wisdom is the way to reverse this decades-long trend is to spend, spend, spend! One example of just how wild this has become is a project they have been busy putting together and promoting that includes building apartments downtown in conjunction with an office building nearing completion. In May of 2015 talks of the residential tower phase of the downtown, Ash Skyline Plaza project resumed after being put on hold because of financing problems. While the two projects are considered separate they are so intertwined it is difficult to recap one without spilling over into the other. The City’s investment of $39 million for the Skyline Garage component includes the construction of the parking garage, land acquisition, site preparation, streetscape improvements, utility upgrades, as well as other project enhancements. Funding for the City's investment in the garage came from a combination of tax increment financing (TIF) funds through the Fort Wayne Redevelopment Commission, Legacy funds, and support from the Allen County-Fort Wayne Capital Improvement Board (CIB). Still, they say no property taxes were used to fund the Skyline Garage. 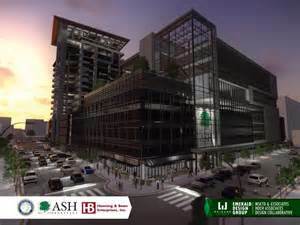 The larger than planned parking garage and additional site work are part of the reason the cost of the Ash Brokerage Corp. headquarters and the multi-use project has jumped to $98 million from $71 million. The project is expected to include a large public investment in the form of tax increment financing funding, Legacy Fort Wayne funding and funding from the Allen County-Fort Wayne Capital Improvement Board. The private investment includes $29 million from Ash Brokerage the largest independently owned brokerage agency in the United States. The $98 million Ash Skyline Plaza project that is nearing completion originally featured a 17-story apartment high-rise next to a 95,000-square-foot building set to hold Ash Brokerage’s new corporate headquarters. Ash Skyline Plaza, the national corporate headquarters for Ash Brokerage, is on track for completion in May. The apartment tower was put on hold but never say die, and that brings us to where we are today. Talks have veiled a plan that envisions a 12-story tower with retail and commercial space on the first two floors. The addition of the commercial component to the residential tower opened the door for the city to apply for federal New Markets Tax Credits, which are designed to encourage economic development in low-income areas. It should be noted these apartments in no way will be inexpensive to lease. Besides dumping in government money and a slew of tax credits the financing appears murky because the city of Fort Wayne has picked up the cost for several parts of this project. The city-funded work that addressed soil conditions at the site and the relocation of a sewer line as well as the project’s publicly financed parking garage with 1,100 parking spaces. The garage will meet current needs, anticipated growth and future development in the downtown area and is larger than the 750 spaces that initially were announced. As noted construction of the garage is substantially complete. The west side of the garage has opened for monthly users from nearby properties and customers visiting the new Lake City Bank. Portions of the east side of the garage remain a construction area. Ash Skyline Plaza, the national corporate headquarters for Ash Brokerage, is on track for completion in May. To expand on this, GLC will be utilizing Community Revitalization Enhancement Credits from the Indiana Economic Development Corporation and New Markets Tax Credits to assist with the financing of the project. The City’s investment toward Skyline Tower will be a $4 million bond paid for through tax increment financing revenue generated by the project. Property tax revenue generated within a TIF district can be captured and used for improvements within that district.after approval by the Fort Wayne Redevelopment Commission and Fort Wayne City Council. Also, the Northeast Indiana Regional Development Authority is expected to consider Skyline Tower as part of the Regional Cities initiative. With these necessary approvals, construction could begin in late summer-early fall. The anticipated completion of the retail and office spaces is expected to be in late summer-early fall 2017, and completion of the residential portion in late 2017-early 2018. It seems that while optimistic about the potential to get this new residential tower built the city delayed making the announcement until it was sure that it had all of the “commitments" needed in order to move forward. A councilman voting against the project said he was uncomfortable with the ratio of public funds to private funds represented. Working through the haze my head began to spin, but it is important to take a closer look at the numbers surrounding this project. The project is expected to cost about $40 million. 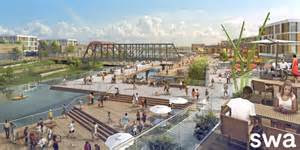 In addition to the $4.1 million from the city, the project is being funded with about $17 million in federal New Markets Tax Credits, about $5 million in local equity, and about $5.5 million in state Community Revitalization Enhancement District (CReED) credits, Brad Toothaker, managing partner of Great Lakes Capital, told the council. The firm has also asked northeast Indiana’s Regional Development Authority for $2.8 million in Regional Cities Initiative funds to fill the final funding gap. “In the spirit of truly getting as much introduction of upside funds into the project, we’re working with the state of Indiana to grow the CReED credits that are available based on some project cost allocations,” Toothaker said. If approved, that would allow the company to reduce its request from the regional development authority. Adding to the feeling the relationships between these groups is a little too incestuous is that both companies, Great Lakes Capital, and the Bradley Company, have committed to relocating their offices into Skyline Tower, which guarantees nearly 70 professionals will occupy a substantial portion of the newly created office space. The Bradley Company recently became a force or known in the area when on December 2, 2014, the Bradley Company announced it was changing the name of Fort Wayne’s commercial real estate full-service broker NAI Harding Dahm to consolidate the Fort Wayne Office under the brand name “Bradley Company. In June of 2013, a merger between Bradley Company and Fort Wayne’s NAI Harding Dahm took place. To make this appear to be happening in real time a constant barrage of upbeat news is being released, such as a story of how Ruth’s Chris Steakhouse seating between 250-300 people and employing about 50 will be located on the first floor of the new Skyline Tower. This will be the fourth Ruth Chris in Indiana. Ruth Chris as an upscale restaurant and while the food is very pretentious the atmosphere is very welcoming. Franchise partner Larry Griggers says when he first presented the idea of opening in Fort Wayne to the restaurant’s corporate office, he was met with silence. He had been studying cities like Omaha, Lexington, Lincoln, Nebraska, so forth,” Griggers said, but he said he ultimately chose Fort Wayne because of the city’s promise to revitalize downtown. The steakhouse will not open until fall of 2017, the foundation may not even be in the ground, but this is confirmation it is happening. Ruth Chris won’t be the only upscale establishment in Skyline Tower. DeBrand Fine Chocolates as well as The Golden, which specializes in craft cocktails, will also be tenants. As far as putting this complex scheme together, a city official is quoted as saying “it’ll be because New Market Tax Credits helped get it done.” The credit awards are determined through a competitive application process, in which a city, nonprofit or bank details the project and looks at the challenges it faces in getting conventional financing then pitches the benefits the project will provide to the community at large. The amount of the tax credits, if awarded, vary depending on the size and scope of the project. According to the U.S. Treasury Department, the New Markets Tax Credit Program attracts investment capital to low-income communities by permitting individual and corporate investors to receive a tax credit against their federal income tax return in exchange for making equity investments in specialized financial institutions called Community Development Entities (CDEs). As a final note, in 2014, the city of Fort Wayne was awarded $33 million in New Markets Tax Credits. When the award was announced in June 2014, the city said it would dole the credits out for multiple projects over the next several years. Two examples of projects that used the credits are The Harrison, a downtown housing development next to Parkview Field (a new baseball facility), and a massive expansion of the Turnstone Center for Children and Adults with Disabilities that added space for sports and other activities to grow. I suggest this is a strong signal that crony capitalism has grown to where government and quasi-government entities have become the main engine of growth. My only fear is that in the end taxpayers will be presented with a bill for these boondoggles and the current exuberance. Footnote; I wrote this article on May first, however, I have been slow to hit the publish button because it may not interest all that many people. Where it becomes important is if many other cities have also started down a similar path that blurs the line between private and public, sound investment and speculation. We are borrowing from the future for pet projects of the political class. Footnote #2; It should be noted that while the amounts being spent may seem very modest to people living in America's coastal cities and other regions of the country these are still substantial sums in many areas. As always your comments are welcome and please feel free to view the archives for another post you might find interesting. Footnote#3 Since this was written the 20 million dollar revitalization of a one block historic area into a multipurpose area is now being hailed as a 30 million dollar project. Yesterday I closed on the sale of a building I have owned for many years known as "One Rose Marie Ally." It was sold to the development group planning to revitalize the historic street called the Landing. It was after what some might describe as being strong-armed or bullied, however, a major consideration is that it will be years before the project ever becomes a reality and even if it does I'm not optimistic as to its economic viability. I personally have not seen a downtown revitalization that has worked. At most it is a temporary thing or affects a very small area with little real effect on the locality. Thanks for the comment, it seems those promoting these projects often gain power by spending money that is not theirs. Hello everyone out there my name is BEVERLEY DORAN, I know i might be sharing this testimony in the wrong forum but have anybody heard of this great spell caster who help to win Lottery and clear all your debts,I want to use this opportunity to thank Great Priest Ogudu for casting winning spell for me to win the lottery of 14,509,500 Million pounds lottery ticket. I have been playing lotteries for the past years now and i have never win any. Ever since then i have not been able to win any lotto and i was so upset and i needed help to win this mega million lottery. so i decided to go on-line and search for help, there i saw so many good testimony about this man called DR-OGUDU of how he has cast lucky spell lotto for people to win the lottery. I contacted him also and tell him i want to win the The National lottery, he cast a spell for me which i use to play and won 14,509,500 Million pounds in The life changing National lottery. I am so grateful to this man, just in-case you also need him to help you win, you can contact him through his email: and he will surely help you just the way he has helped me. i will forever be grateful to him and always testify the good work of him to the whole world. Is The "Stop Globalization" Movement Justified? Trump's Choice Of Pence, Good Or Bad? Hillary Fooled Me Once, Shame On Her!